Whatspp has made itself a household name by providing easy-to-communicate with loved ones with less to no friction. 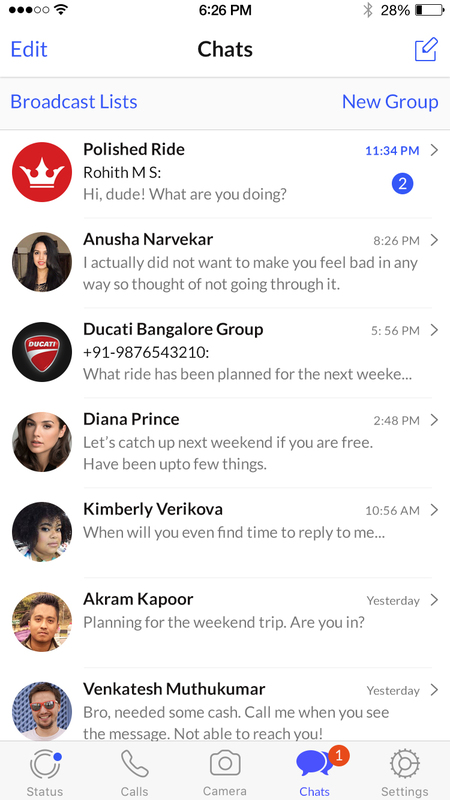 With features like Chatting, Audio & Video call, Sharing Pics & Videos, send recorded audio notes and more, it has taken strides towards establishing itself as a formidable freeware and cross-platform instant messaging services for smartphones. 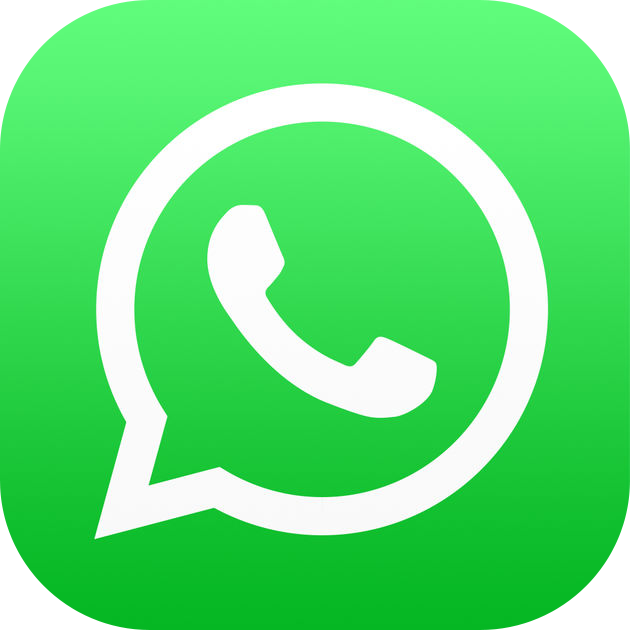 Instant messaging like Whatsapp is used for all communication needs today - from keeping in touch with friends and family, to gossiping with best buds, and most of all for planning events, both small and large. Most plans however, fail because someone did not respond in a group, because they could not find information about the plan or did not know who all are going. It is important and motivating to see how many people are going to be able to refuse with awkwardness. The existing solutions for group chats do not address these needs. Even planning is nightmare. Event planning is a light-weight, simple to use feature within a group chat which allows group members to collaboratively plan events with other group members. I tried to do my audit on the features and best practices of the best even planning platforms in the market like Google calendar, Facebook page Events to understand the best and worst ways they addressed user needs. 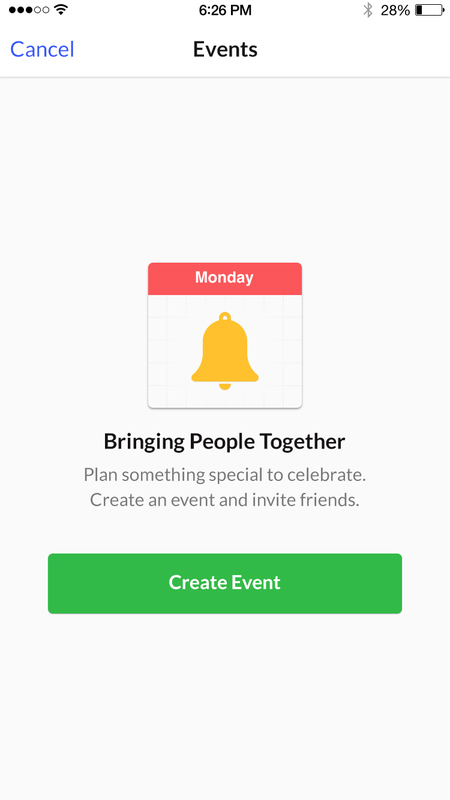 - Users are always looking for ways to plan meet-ups. Whatsapp has a multi-million users to have a substantial reach. There are users in every segment of the digital platform. 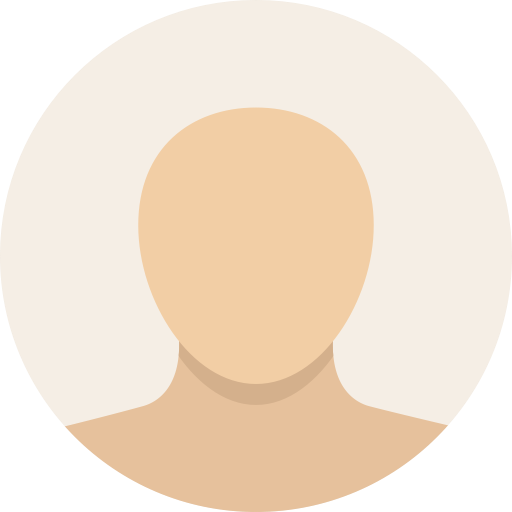 I considered to create 3 user personas which I can use to build my feature to understand my target demographic, motivations, habits and more. Venkat Ramamurthy, Male, 40 years old, Married, Full-time Marketing Manager, Lives in Mumbai, India. - Marketing assistant at a add agency. - Busy and career focused. Has little leisure time, but enjoys social media to catch up with friends. - Everyday commute is long 3 hours, so uses that time to catch up on global events. - Moderate social apps user coz of peer pressure. 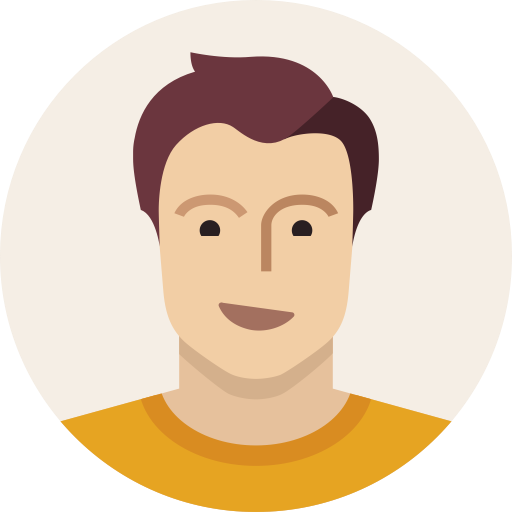 Chuck Jones, Male, 30 years old, Married, Development Lead, Lives in Delhi, India. - Is a moderate Instagram and Facebook user. These are ways to keep up with friends and family. - Consumes information or data fast. Needs content that is easily attend and digestible. - Goal oriented, Avid traveller, Movie buff. - Events planner for his group of friends. Anusha Narvekar, Female, 18 years old, single, student, Lives in Bangalore, India. - Enjoys social interaction with friends and family. Plans weekly meetings. - Most engaged with various social apps or any type of games that has engagement features. Drawn to games that remind her of her childhood. 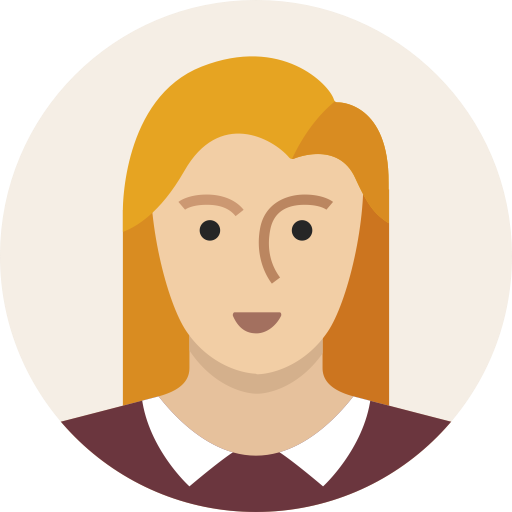 - Doesn’t want to waste time on planning meets, wants everything to happen in a quick seamless manner. But doesn’t mind spending time on travel. Once I developed a deeper understand of my users and their needs, I identified the common pain points from my usability test through affinity mapping. - User want to meet their friends. 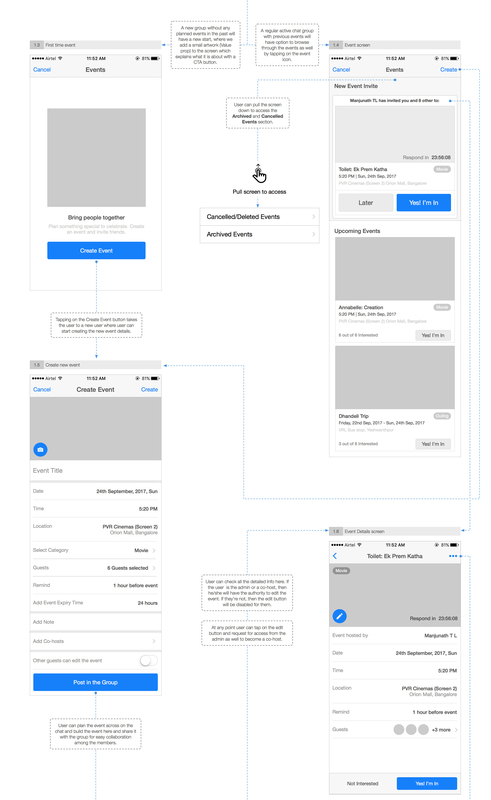 It is important to recognise that there are several different ways to come up with a solution for this but my goal was to create a UI which can integrate into the current app in a seamless manner. Event planner should not have the main focus but should still be present for easy access. I started with paper sketches to put my thoughts and idea out to see how and what direction I can take them in to keep the UI simple and UX stronger. Once I was confident with this, then I moved to the next stage. With the proper planning, I was able to confidently create the functionality flow of the feature. I started capturing the functionality by breaking down them into flow and grouping them into clusters of information which I can use later on keep the UI clear and simple. I started by having a look at the sketches in hand and by placing them in layouts in the high fidelity wireframe to meaningfully group information. 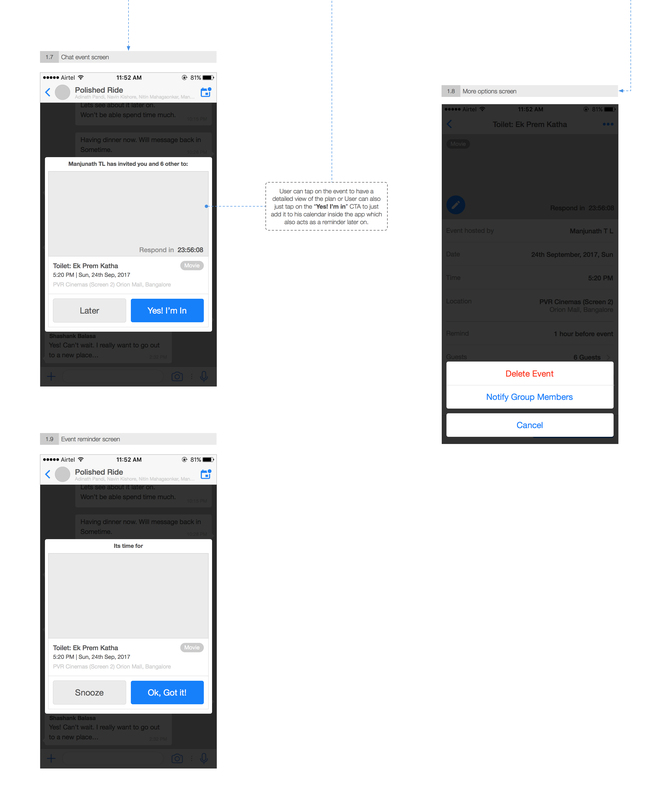 This way I was able to create the skeletal UI frame to place the feature and its flow with which I could validate my assumptions to avoid complication. I conducted a basic supplemental research and testing with friends to ensure my design was backed by data to make it performant, scalable & brand-able. I wanted to follow the visual language of the existing WhatsApp but added a different shade of blue to have a light differentiation to merge my design into the frame. I wanted a flat, minimal aesthetic, just enough to communicate the information, but not too much that it breaks the visual flow of the app. For a feature to be successful, user engagement is the key goal. To measure the success, the purpose of the feature, outcomes and goals should be clear to determine the right metrics for the feature. Below I’ve tried to list down few steps we can take to measure that. Step 1: Measure basic usage of the new feature: Track the number of users on a daily, weekly that can be further broken down by device, age, demography and others. This helps in planning for the growth of the app as well. Step 2: Users: The active user metrics is different than app installation, where you can even track the recurring users, session intervals, session length, time spent on the app to capture the feature usage patterns. 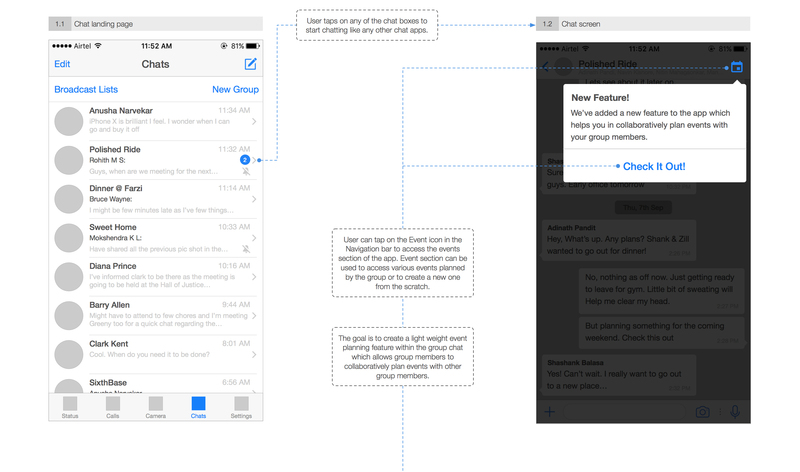 Step 3: Usage Patterns: Start analysing the type of events users are creating and sharing. What is the response for the events shared by and from the users which you can monitor to build better retention. Step 4: Retention: Retention is critical to the success of any app. Retention rate of the feature in the last 30 days to understand the addiction of the users to the feature introduced. 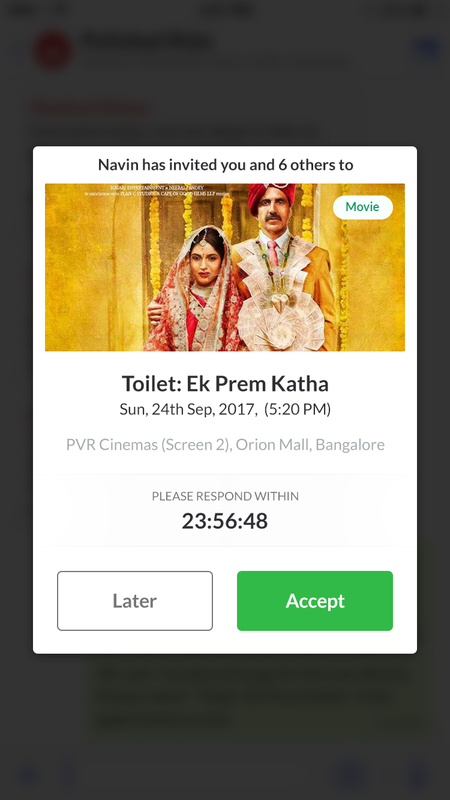 Real time tracking or cohort tracking highlights most valuable and engaged users list to create a more robust UX to build better app experience. Step 5: Measure the impact of the new feature on engagement: You can start by monitoring the users who are creating events, these users are more active than others. This percentage can help you in taking decisions to build better engagement. However, I think the largest victory for me was to work on a intuitive approach to plan events. 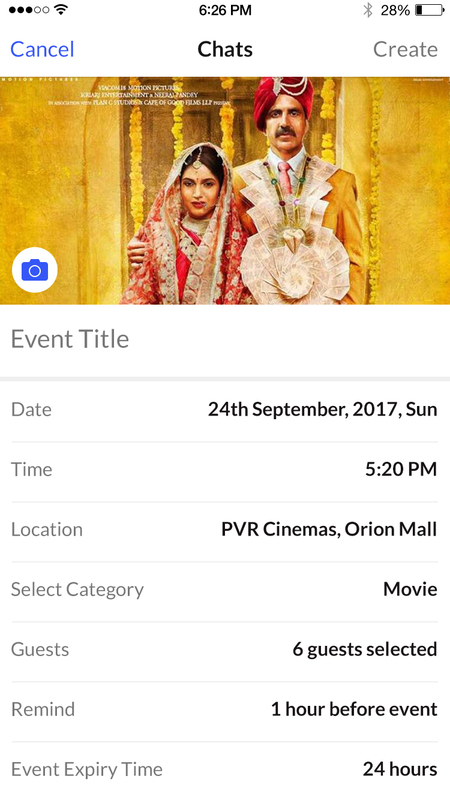 The focus should always be on the experience, which in this case was the user being able to plan events to create experience for the group. And of course, the best UI is invisible. The response expected is be overwhelmingly positive, from users and the media. 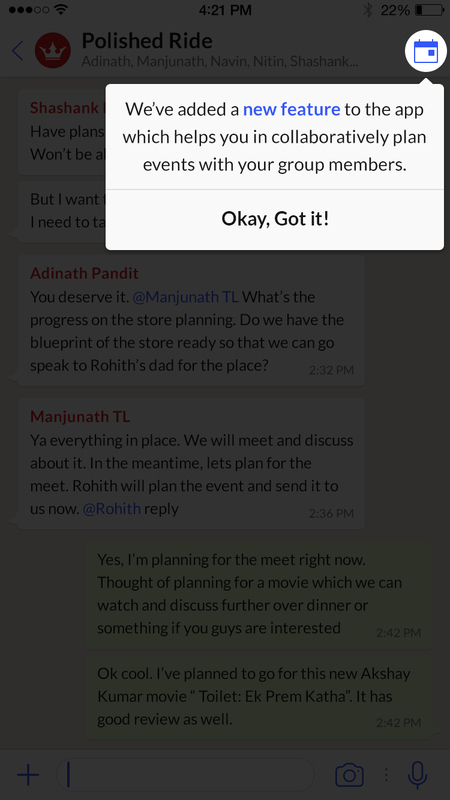 Users generally find it difficult to plan events across in a group coz of the infinite chatting process and not concluding on anything until properly communicated to.